I like Kalman's work anyway, but she took a brilliant book and made it even more brilliant. The wit and inventiveness in her illustrations provide the perfect counterpoint to the wit and wisdom of the text -- if you're a big grammar nerd such as myself, that is. This is the delightfully droll, tongue-in-cheek illustrated version of the gold standard in American composition. I've been told this should be a writer's Bible...haven't read/consulted it yet though. I love this book. It is so clear and so funny in its sternness. A must have for anybody who wants to write (anything). The illustrated version adds even more to the quirkiness without subtracting from the subject matter. I'm sure we have more copies of "The Little Book" around the house, but I couldn't resist this illustrated version. Invaluable. A compendium of important rules to check when you are revising you work. What every writer should own. That’s right. For my 26th book (halfway there!) I decided to finally read through this classic guide to writing. The copy I picked up is a special illustrated edition, which made me feel as though I were reading something more elaborate than small grammar and style textbook. This book has been around for years, with multiple versions and editions dating back to the 1920s. It is a slim book containing six chapters that have been finely edited to provide the reader with just enough guidance to improve his or her writing without weighing him or her down with hundreds of individual rules. It covers grammar, composition, form, expressions, style rules and spelling. You may be asking yourself why someone might choose to read this book cover to cover, as opposed to perhaps purchasing it to keep as a reference. 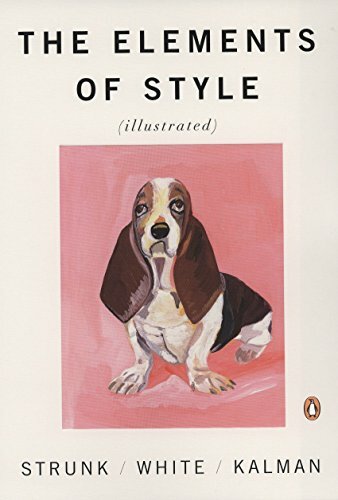 I will certainly keep it as a reference, but I found that by reading through it I received a much-needed refresher on grammar rules (although Mr. Strunk and I disagree on what is commonly known as the ‘Oxford Comma’ – he uses it and I don’t). I also appreciated the composition and style suggestions. As I have been writing more this year – both for the Cannonball Read and for my own blog – I appreciate suggestions to help improve my writing. Mr. Strunk and Mr. White appreciate brevity and the willingness to take a stance on a topic when writing and I can benefit from incorporating both suggestions more often. The most relevant lesson for me was woven throughout the book and mentioned in different areas: the lesson of clarity. Why try to sound fancy when fewer words would be clearer to the reader? Keeping both by message and the reader in mind should help me to improve my writing over time. A classic. Clear, concise, and quirky.